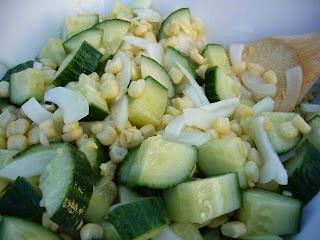 Combine cucumber, corn and onion and set aside. Put vinegar and a sprinkling of salt in a separate bowl and drizzle olive oil in while whisking the mixture together. Add mustard and whisk together to emulsify the dressing. Pour vinaigrette over salad and enjoy! Loved it! Served it with BarB Q Chicken. It would be good to know how many ears of fresh corn to buy - I bought only two and that yielded only one cup. But no problem just cut down on other ingredients. Will make it again and might cut down on the onion. Hi judyd - a good rule of thumb is a 1/2 cup of corn for each ear. If you have a little more or a little less, it's not a problem with this salad as the measurements don't need to be exact. Enjoy!